For safety for all visitors, coolers will be checked for glass bottles, which are prohibited at the park. No amplified music is allowed so make sure you bring your ear buds! 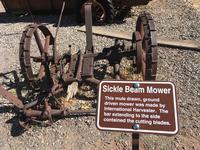 The Slide Rock Market is open year-round with seasonal hours of operation. 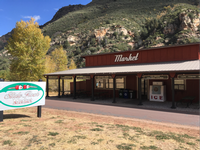 The market offers: snacks, water, film, sunscreen and Slide Rock memorabilia. November through March: Saturdays and Sundays from 10 a.m. – 4 p.m.
April through October: Saturdays and Sundays from 10 a.m. – 6 p.m., Mondays - Fridays 10 a.m. – 4 p.m.
Gazebo style kiosk with eight poster boards displaying general Pendley Homestead information and park information. 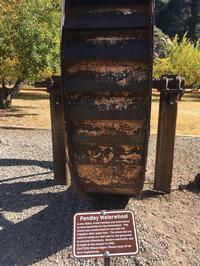 Historic farm implements are displayed along the Pendley Homestead Trail. 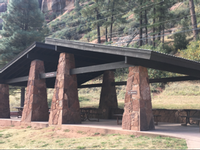 There are two covered ramadas with electrical outlets and picnic bench seating. Each ramada will hold approximately 50 people. Ramadas may be reserved for $75 a piece; plus a $5 non-refundable reservation fee. Contact the park for further information or to make reservations for the designated months. Charcoal fires are permitted in designated grills only. No wood fires allowed in grills. Propane grills and stoves are allowed. Smoking allowed in vehicles only. NOTE: Slide Rock does not take ramada reservations between the Friday before Memorial Day and Labor Day Monday. 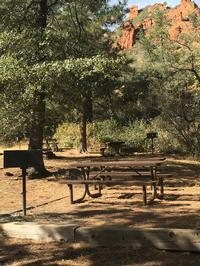 Fifteen open air picnic areas suitable for small groups are available near the entry station and parking lot on a first-come, first-served basis. Charcoal fires are permitted in designated grills only. No wood fires allowed in grills. Propane grills and stoves are allowed. Smoking allowed in vehicles only. Two modern, ADA accessible restroom buildings with sinks and a drinking fountain are located above the creek with flush toilets. A flush-free, waterless vault toilet is available near the creek. The vault toilet is not ADA accessible. No pets or glass containers in the swim area. Pets are not to be left in a vehicle. Pets must be kept on a leash and attended to at all times. Charcoal fires are permitted in designated grills only. No wood fires allowed in grills. Propane grills and stoves are allowed. Smoking allowed in vehicles only. Damaging or removing rocks, vegetation, or public property is prohibited. This area contains many natural hazards. Please enjoy with caution. Rocks and creek beds are slippery when wet or icy.